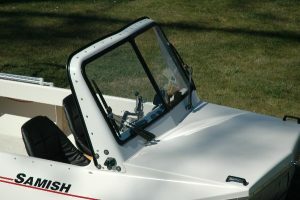 Carbon fiber windshield frame with glass windows and a dual wiper/wash system. 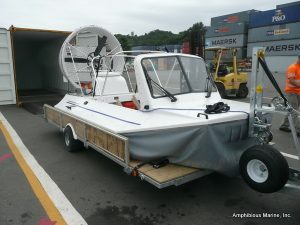 Need a way to transport your Vanguard hovercraft to and from the water? 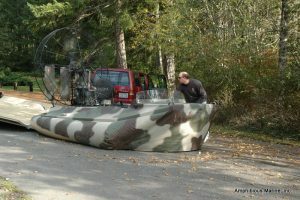 Our Rapid Deployment trailer allows you to easily load and off load your Vanguard hovercraft in almost any launching situation. Save money on dock and launch fees. Launch where no facilities exist which really reduces the crowds and competition. 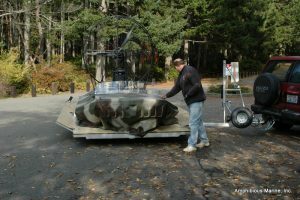 With an 85° swiveling tilt deck, folding sides, tilt winch, craft winch, our Fly On-Fly Off trailer makes loading and off loading easy. You can do it yourself quickly without breaking a sweat. 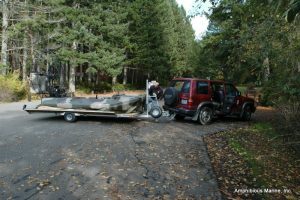 Tough and lightweight, the Rapid Deployment trailer features a welded box steel frame that is hot dipped galvanized with a pressure treated tongue and groove plywood deck to give you long service life including saltwater use. 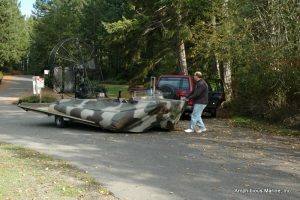 As a bonus it only weighs 860lbs, so no trailer brakes are needed. 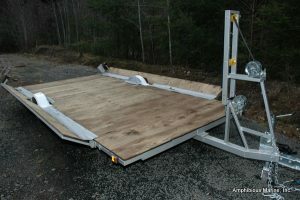 The trailer is equipped with LED lighting. Stainless exhaust , stainless exhaust studs, stainless wired nuts, four drilled brass nuts, two exhaust gaskets, stainless heat shield. Electrical components on the engine are upgraded with sealed connectors. Quick disconnect Weatherpak disconnects are used where necessary. The engine is coated with a rust inhibitor. Stainless steel engine propeller frame. 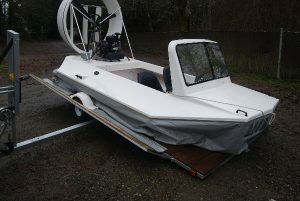 All fasteners used on the craft are stainless steel. 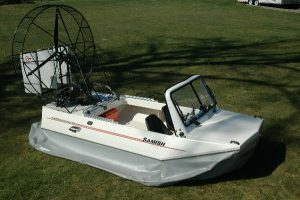 The engine electrics are weather proofed.